My name is Mark and I’m the father of 3 young girls, ages 4, 8, and 10. My wife has been homeschooling our daughters for 5 years and we’ve used a variety of curriculum. We had been looking for supplemental reading tools to motivate our daughters and move away from tedious paper and pencil drill. 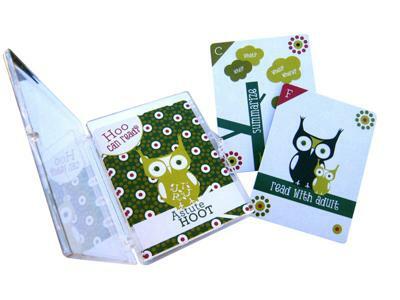 We discovered Astute Hoot at the Arizona Homeschool Convention in July. We purchased 2 different flashcard decks, Hoo Can Read? and Hoo is Ready for School?. We have been amazed at how these materials have motivated all of our daughters to read. These flashcards keep a sense of playfulness and fun while directing children’s attention to crucial literacy skills such as fluency, comprehension, phonics, etc. My wife and I were impressed that these products were created by veteran teachers who are experts in their field. I highly recommend Astute Hoot’s products. Join in and write your own page! It’s easy to do. How? Simply click here to return to Homeschool Educational Supplements and Games.